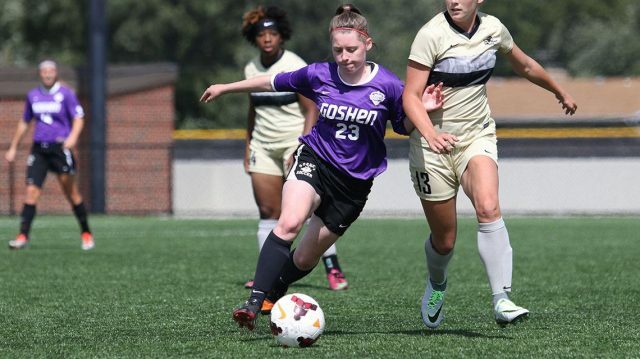 The Goshen College women’s soccer team extended their season record to 4-1-1 on Tuesday, after defeating Holy Cross College 2-0 at home. The game was the Leafs’ first home win after last week’s game against the University of Michigan-Dearborn was abandoned due to lightning in the 27th minute. Had the weather held off for seven minutes, the 1-0 Goshen lead would have stood and added to the Leafs’ record. The match was Goshen’s Go 4 The Goal game to raise support and awareness for pediatric cancer. The bleachers were decorated with gold balloons and tassels, spectators filled the stands in gold and yellow attire and the team wore gold shoelaces to show their support. A halftime crossbar challenge competition also took place in order to raise money for the cause. With the fans out at large to show their support, it was up to the Leafs to deliver the entertainment. As the first half kicked off the Maple Leafs found themselves deep in the Saints half. Junior Taliah Borom took the first three shots of the game, two of them on target and the other going high over the goal. In the 28th minute, the Leafs managed to find the net. A dangerous cross from freshman Lauren Cernak missed the two Maple Leafs in the box and was attempted to be cleared by the Saints defense. Instead Holy Cross put the ball into their own goal to give the Maple Leafs the lead. The Leafs continued to test the Saints’ defense. The next four shots in the game all came from the Maple Leafs with the Saints still unable to get a single shot off. With just under nine minutes left in the first half, Goshen picked up a free kick outside the opponents 18-yard box. Cerneck struck the ball towards the keeper Sydney Bright who attempted to make the save. The ball spilled out and fell to junior Megan Bower who tapped the rebound into the goal to increase the scoreline to 2-0. The second half began with Goshen taking another four shots on goal, two of which required a save from Bright, the other two missed the target. Twelve minutes into the second half, sophomore Katie Baer was called upon to make her first save of the night, following a shot from the Saints’ Kailee Zimmerman. The Leafs thought they’d extended their lead once again from another tap-in by Bower, but the goal was disallowed and ruled as offside. The junior now has two goals in two games. Borom led the team with five shots, three of which were on goal, followed by Bower and Cerneck. Goshen outshot the Saints 17-4 and was only required to make two saves, compared to Holy Cross’ eight. Reflecting on the night, junior Kaitlin Begley, a captain on the team, spoke of the importance of the Go 4 the Goal game. “The night was amazing!” she said. “The crowd was electric, the team was bought in, it was just a night I won’t forget. The Maple Leafs can next be seen in action on Saturday, Sept. 15, in a doubleheader with the men’s soccer team at the John Ingold Athletic Complex. The Women face the University of Rio Grande at 4 p.m., followed by the men at 7 p.m. against Indiana University East.